Ian Sternthal the founder and driving force behind Sternthal Books– a boutique art book publishing company, has recently released a new and compelling publication entitled ‘The Rothfeld Collection’; a beautiful and insightful introduction into Donald Rothfeld’s private collection of one hundred and sixty works of art created by Israeli artists, recently donated to the Katzen Arts Center at the American University in Washington, D.C. 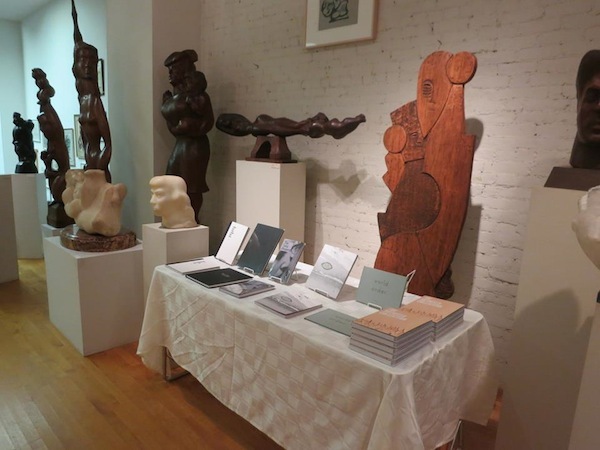 The book had a launch event at an amazing New York milestone – The Chaim and Renee Gross Foundation, which today houses an incredibly vast collection of art – including African art, gifts he received from other artists, as well as Gross’s own work. Donald Rothfeld and his late wife have spent the past twenty-five years collecting works from Israeli contemporary artists in what has become (perhaps unintentionally) a comprehensive survey of Israeli art. 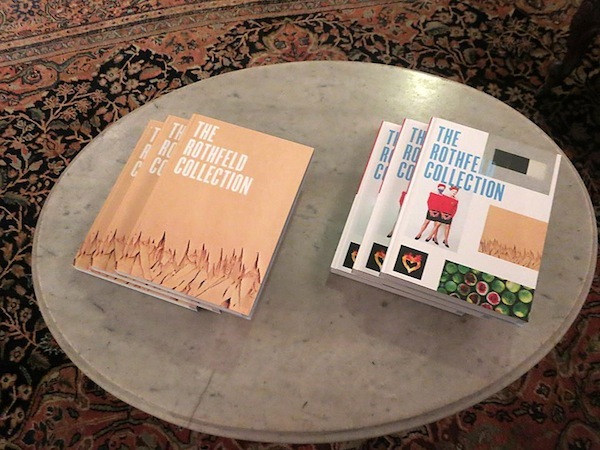 Apart from being an impressive art collection—one collected with passion, emotional investment and zeal—the Rothfeld collection can be interpreted as a gateway to Israeli art. Most, if not all, of Israel’s leading artists are represented in the collection with no apparent preference for media, artistic movement or a certain era. In fact, it would seem that the only thing uniting the ‘Rothfeld artists’ is the fact that they are Israeli. Designed by Sternthal himself, the book presents vast parts of the collection accompanied by ten scholarly essays. 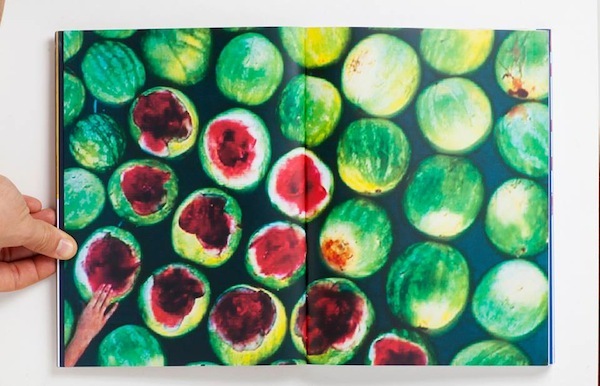 Printed beautifully on glossy paper, each work of art is granted an entire page or double spread; a layout that manages to convey that the motivation for this collection was not necessarily personal taste or aesthetics, but rather a true dedication to the enterprise of “Israeli art”. 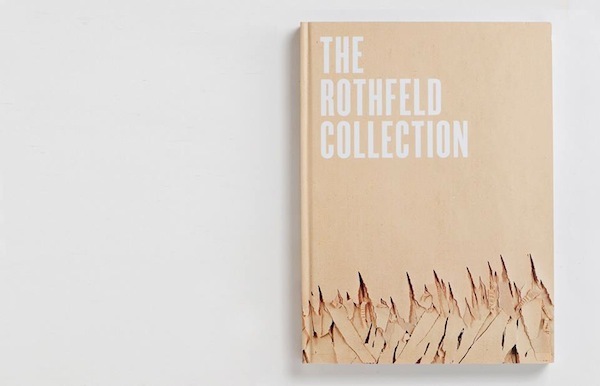 While there is no doubt that the focal point of the book is the artwork, “The Rothfeld Collection” still does not function merely as a picture album, and includes essays contributed by Israel’s leading art historians and thinkers. 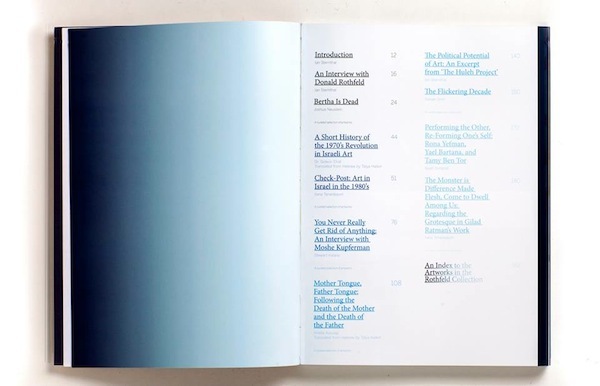 Printed on trimmed paper, the texts are spread throughout the book amongst the art, in what Sternthal metaphorically calls “islands of history and testimony surrounded by a sea of images.” The texts are presented in a somewhat chronological order- an editorial decision, which helps create the feeling that this is more of an art historical survey than an album. The essays provide the readers with deep insights into trends in Israeli art and its various modes of production. Extremely compelling are Ariella Azoulay’s “Mother Tongue, Father Tongue” (published here in English for the first time) and Noah Simblist’s “Performing the Other, Re-Forming One’s Self”. Both texts deal with questions of identity and are embedded in the underlying theme of the collection, what Sternthal calls “the shared identity [of its] creators”. A theme that seems most befitting in the context of Israeli art and its near obsession for issues of identity. 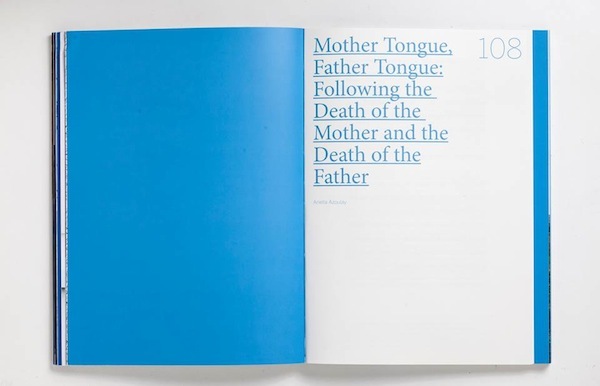 “Mother Tongue, Father Tongue- Following the Death of the Mother and The Death of the Father”, by Ariella Azoulay. Translated by Talya Halkin, edited by Ian Sternthal. Appearing for the first time in English. In viewing this book it would be easy to forget that this is a private art collection and not an historical account of art produced in Israel over the past thirty years. However, the absence of large segments of Israeli art history, namely art produced by minority groups, reminds us that this this is still a personal selection and cannot be seen as an accurate reflection of the Israeli art scene. Nonetheless, the collection and subsequently the book, exposes its viewers to the main trends and to the canon of Israeli art. 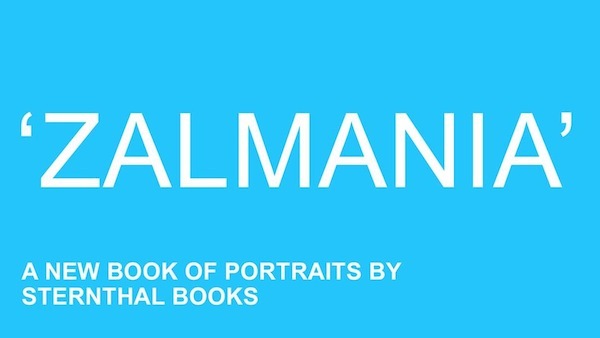 In addition to this remarkable publication, Sternthal has also launched a Kickstarter campaign to help realize his ongoing collaboration with the ‘Pri-Or’ PhotoHouse in Tel Aviv- the ‘Zalmania’. Over the past seven years Sternthal has taken upon himself to research, digitize and archive a portion of the portraits housed in this famous establishment, with the end-goal of creating a book, an E-book and a travelling exhibition. 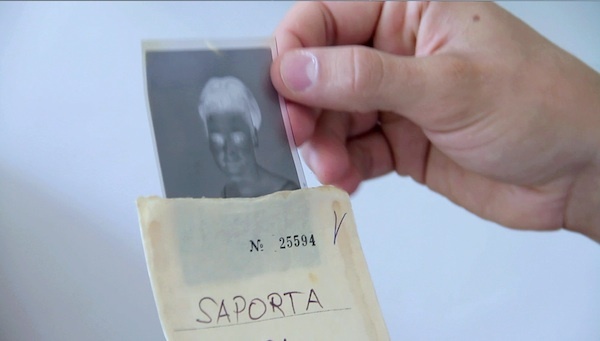 The ‘Zalmania’ and the ‘Pri-Or’ Photo House first became known to the general public through Tamar Tal’s 2011 documentary film bearing the same name. 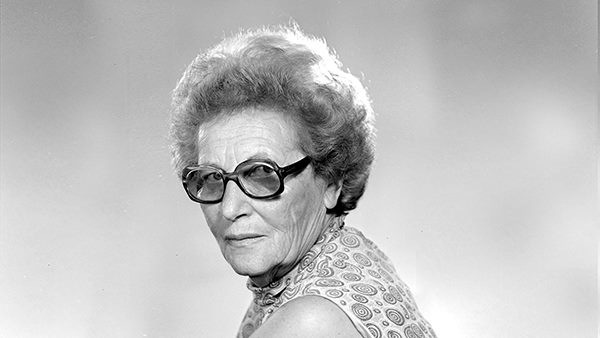 The film introduced Miriam and Rudi Weissenstein’s business and lifework, The Pri-Or Photo House; one of Tel Aviv most prolific photo studios, which is responsible for many of the country’s most recognized historical photos. 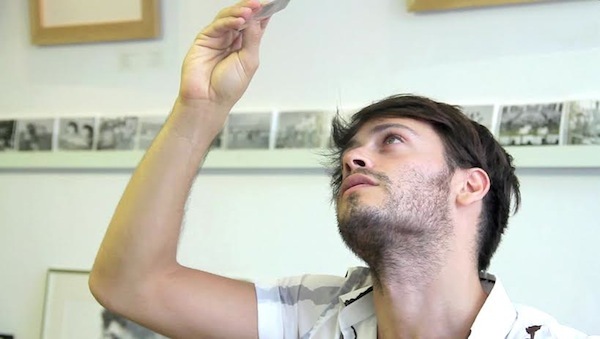 In his Kickstarter video, Sternthal reveals to us, however, that one of the studio’s main focuses was in fact portraiture, and that for more than seventy years–from its opening in 1940 till Rudi Weissenstein’s death in 1992– the studio shot thousands of portraits, including those of the country’s leaders, its celebrities and its common people. But whereas Tal’s film focused on charged emotional relationships revolving around the Zalmania and the Weissenstein family members, Sternthal’s project is more of an historical one. The effort to digitize the thousands of portraits and to document them in a book is an effort to catch a lost part of Israel. It is an effort to give an aesthetic account of Israeli society at a certain moment in time. It is a romantic and noble effort to preserve something that has passed and will not return. To learn more and support the project visit the kickstarter website by clicking here. The campaign will end on January 24th – and in exchange for your contributions, they are offering a variety of great photography rewards. Post by Adi Puterman, to read previous articles by Puterman, click here.